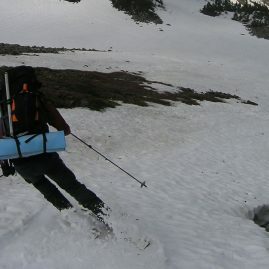 Intro to Ski Alpinism helps achieve dreams of riding off Baker, Rainier, Shuksan or just touring to Camp Muir. 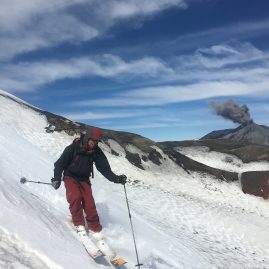 This popular course takes your touring into the high alpine; teaching the fundamental skills of snow, ice, glacier, climbing techniques for ascent and glisse-descent of glaciated mountains. 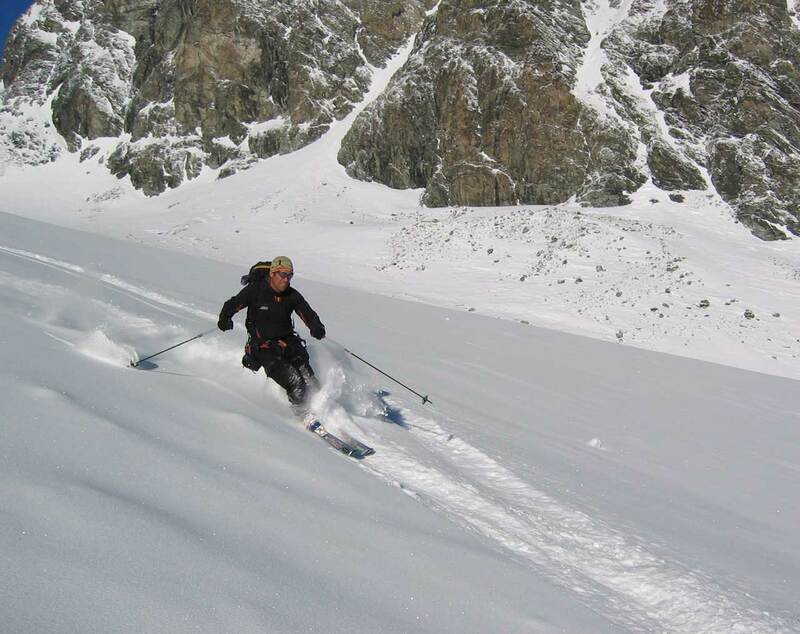 You learn how to be safe, self-reliant ski-mountaineers ready to climb and ski locally or in the great ranges of the world. This course is truly an excellent foundation for any rider seeking independence in the alpine arena. 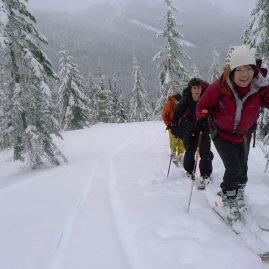 Spend three days in the Coast Range of BC or the North Cascades where active glaciers, volcanic peaks, and breathtaking views create the ideal learning environment. A summit attempt on the last day of the course gives you the chance to put your newly developed skills to the test. 6:30am orientation. After an initial meeting and equipment check, we drive from Seattle to the trailhead and begin our hike to base camp. This approach is very strenuous and can take from 4 – 6 hours depending upon the particular approach and the fitness of the group. (This is where all of your training pays off!) You’ll skin through ancient forests and snow covered alpine meadows, enroute to our base camp. After establishing our camp, the remainder of the day will focus on the skills necessary for the proper use of an ice axe, traveling in balance, self-belay, self-arrest, placing various types of snow protection for use in the construction of snow anchors, as well as belay techniques. We hope to cap the day with a short evening ski run before dinner. You will begin the day by learning crampon use and climbing steeper snow and ice. We then focus on the skills required for safe and efficient glacier travel including roped travel and self-rescue (prussiking) techniques. This will include the means for each team member to correctly tie into the rope including the proper spacing of climbers based on the number of team members. 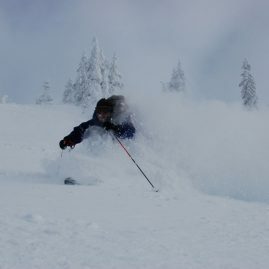 We will cover the difference in traveling with skis versus snowshoes or crampons, ie when you need to rope up. After learning the proper techniques for traveling as a rope team, we will then make a short glacial “tour”, enabling us to practice and comprehend the day’s lessons. We follow that lesson up with a few runs before skiing back to camp. Discussions late in the day will focus on navigation with the use of map and compass. After a pre-dawn wake-up and a quick breakfast, we climb our way toward the summit. Today your group will apply the skills they have been practicing toward our ascent of a major glaciated peak. Depending on conditions and the pace of your group, it will take from five to eight hours to reach the summit. After enjoying the views and a snack, and absorbing your accomplishments, students will navigate and lead their team back to high camp, enjoying a well-earned glisse descent. Enroute to camp we learn crevasse rescue techniques, including constructing and equalizing multiple anchor points and practicing rescue scenarios thenr descend to the valley where we will celebrate a successful trip and begin planning the next climbing adventure. 7:30 Drive to Peyto Lake (2,200’) after dropping off the vehicle on the other end of the tour. The tour gains 4,000’ in 6 miles to the Peyto Hut.4-6 hours. 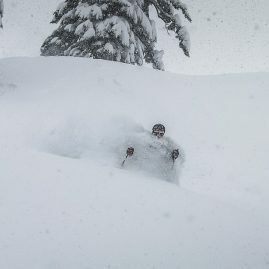 The remainder of the day will focus on the skills necessary for the proper use of an ice axe, traveling in balance, self-belay, self-arrest, placing various types of snow protection for use in the construction of snow anchors, as well as belay techniques. We will cap the day with a short evening ski run before dinner. From Peyto Hut the route ascends southwest onto the Wapta Icefield with Mount Thompson on our left (east) and Rhondda South on your right (west). 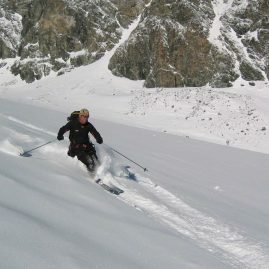 Ski descents along the route are plentiful. With St. Nicholas in your view dead ahead you will eventually loose elevation and can ski down with towards the Bow hut with St. Nicholas on you right. The tour will be 3-4 hours covering 3.7 miles gaining 492ft, descending 984ft. While traveling we will learn crampon use and climbing steeper snow and ice. We then focus on the skills required for safe and efficient glacier travel including roped travel and self-rescue (prussiking) techniques. This will include the means for each team member to correctly tie into the rope including the proper spacing of climbers based on the number of team members. 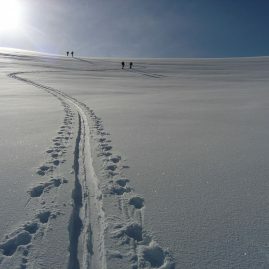 We will cover the difference in traveling with skis versus snowshoes or crampons, ie when you need to rope up. We will spend the first half of the day skiing one ofthe many objectives of Gordon, St Nicholas then in the afternoon; go over crevasse rescue then relax in the comfort of the Bow Hut for another night! Bow Hut to Balfour Hut starts with a steep 1000′ climb up the Wapta Glacier heading west of the Bow hut. Our route offers multiple route options. 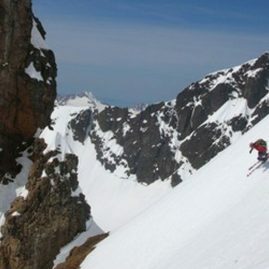 Ascend the St. Nicholas Peak-Olive col and then ski down the Vulture Glacier. The second option ski tour around the East side of St. Nicholas Peak until you reach the west side of the St. Nicholas Peak-Olive col then ski down the Vulture Glacier to the Balfour hut. 4-5 hours covering 4.3 miles with elevation gain of 1,902ft and descent of 1,410ft. Balfour Hut to the road can go back by the Bow hut or past the Scott Duncan hut. Exiting via the Scheisser/Lomas route takes us up and over the Balfour High Col, the crux of the Wapta traverse. Exposure to avalanches, ice fall and crevasses. require good weather to gain the upper reaches of the route where things will mellow out a bit and take you away from icefall danger off of Mount Balfour. Ski tour across the High Col till we can remove skins and ski down the Wapituk Glacier totoward Mount NIles using the Scheisser/Lomas route which is an 11km ski tour to the West Louise Lodge. The descent of 3,900ft takes 5 – 6 hours to complete and in bad weather can be quite challenging. After a few kilometers from the hut, you will come to a small peak go to the right of this and descend down to the westerly shoulder of Mount Niles. Ski through the trees a short distance until you find Sherbrook Creek bed and then follow this out to Sherbrook Lake and cross it to the far end. Ascend the slope on your left and begin searching for the summer trail or remnants of ski tracks which will lead you east around the shoulder of Paget Peak to the West Louise Lodge on Highway 1 a few kilometers away. Caution required gaining the ridge for the last climb to the hut. 5-7 hours over 6.2 miles climbing 1,700ft then descending 800ft.